Anti-evolution bills to teach creationism have evolved. Creationists provide an example of descent with modification. Photo illustration by Natalie Matthews-Ramo. Photos by Eric Isselee/Shutterstock, Paul S. Wolf/Shutterstock, jlarrumbe/Shutterstock, Harald Toepfer/Shutterstock. The camouflage was impeccable. With the name “Louisiana Science Education Act,” the bill posed as a document on the side of truth and science. By claiming to promote “critical thinking skills, logical analysis, and open and objective discussion of scientific theories,” it seemed to endorse levelheaded rationality. And by denying that it sought to “promote any religious doctrine,” it cleverly deflected accusations of being an effort to replace the teaching of evolution with the religious beliefs of creationism—which is, of course, exactly what the bill was. In reality, the Louisiana Science Education Act sought to undermine science education in the most insidious way: by giving teachers the authority to teach religious materials in class as an alternative to the scientific theory of evolution. Unfortunately, it worked. By avoiding any mention of creationism and encouraging a “critical analysis” of evolution, the bill skirted claims that it would violate the U.S. Constitution by encouraging the teaching of religious doctrine. In 2008, it was successfully passed by the state senate and signed into law by Louisiana Gov. Bobby Jindal. But how did creationists think of such a perfect way to frame their anti-science agenda? You might think that such a bill came into this world fully formed, like Adam and Eve in the Garden of Eden. But actually, it had a predecessor. An ancestor, you might even call it. In what is almost a too-clever illustration of how evolution works, a scientist at Australian National University has created a chart to show us the evolution of anti-evolution bills. The study was published last week in Science, on the 10th anniversary of the historic Kitzmiller v. Dover Area School District trial, which struck down the teaching of intelligent design, an attempt to mask creationism with pseudo-scientific language. Evolutionary biologist Nick Matzke revealed how these bills have evolved over time to avoid potential predators such as the pesky Constitution and public outcry. His conclusion: These bills are an example of descent with modification. We can only assume that Darwin is rolling in his grave. Nick Matzke’s original phylogenetic tree of anti-evolution legislation. 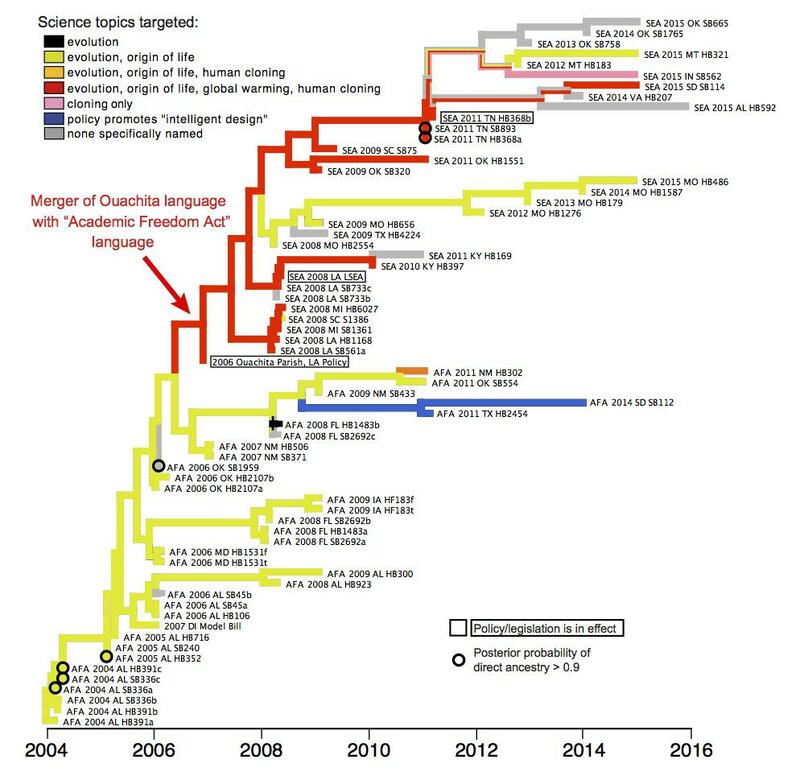 To make the chart, Matzke performed a phylogenetic analysis, tracking the language in 65 bills since 2004 that have sought to limit or oppose the teaching of evolution. He found that these bills had been directly reproduced with a few mutations and modifications. For the most part, all employed the seemingly reasonable-sounding strategy of encouraging educators to “teach the controversy.” Shocker: It’s the same technique that has been used in bills that oppose the teaching of climate change. While these bills are sneaky, Matzke’s handy chart shows that it’s possible to find the common roots of these sorts of anti-science efforts. In his words: “They are not terribly intelligently designed.” So thank you, Dr. Matzke, for revealing these bills for what they truly are: religion in disguise. And thank you, creationists, for providing a robust teaching tool for a theory you claim does not exist.